"Did you see the Leaning Tower of Pisa?" more than one person has inquired upon hearing that I recently visited Italy. 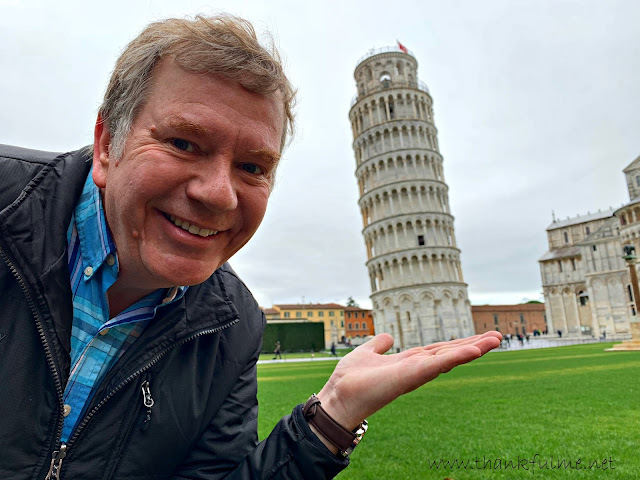 The tower is an iconic symbol, but before my vacation, I couldn't tell you too much about it, other than the fact that it leans. 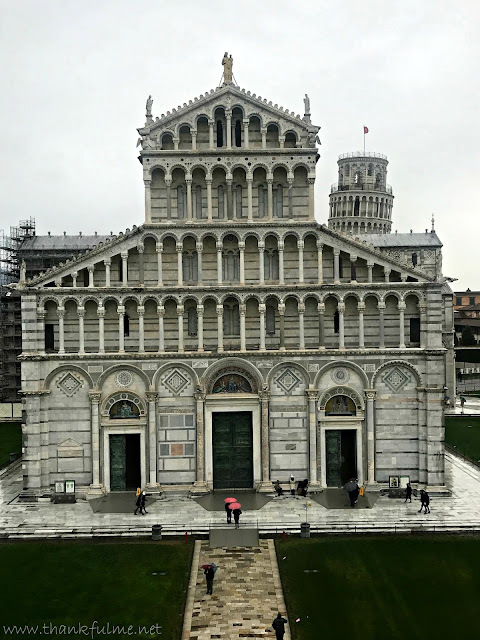 It is the bell tower for the cathedral in Pisa. A baptistery stands across from the cathedral, or duomo. 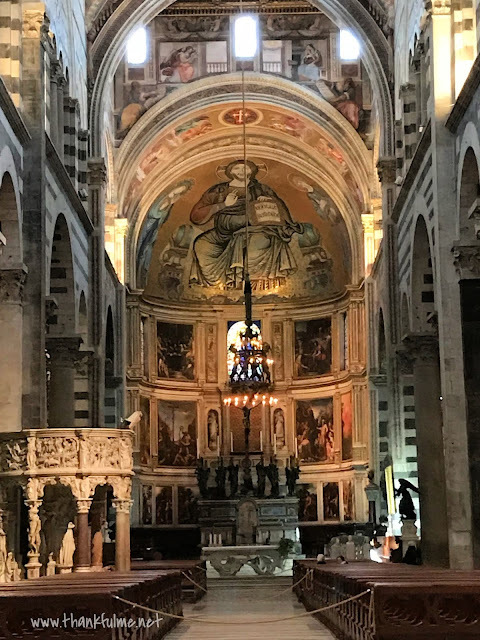 Our guide told us that in the early years, a person needed to be baptized before being allowed into the cathedral. 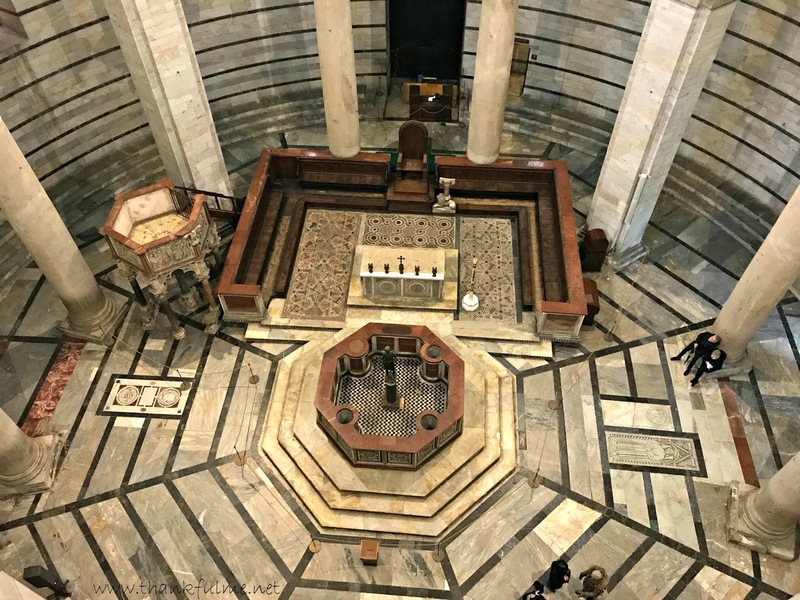 Photo: An aerial view of inside the baptistery. The octagonal font is in the center. Built in medieval times, the tower started leaning almost immediately after construction started. Several attempts were made to straighten it, but to no avail. 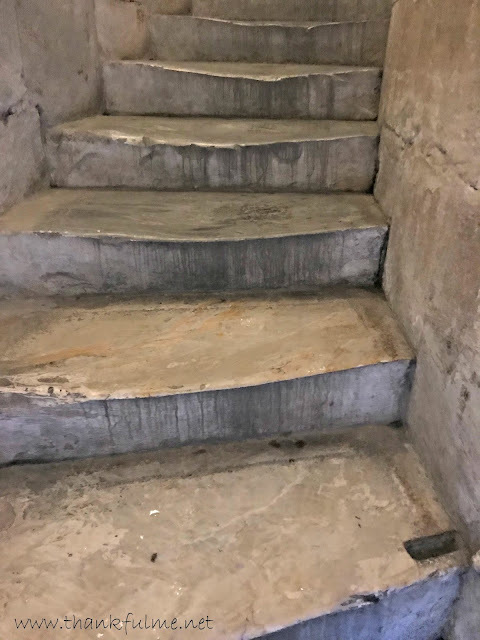 In recent years, the tower has been stabilized, and visitors are allowed inside to climb the crooked stairs. 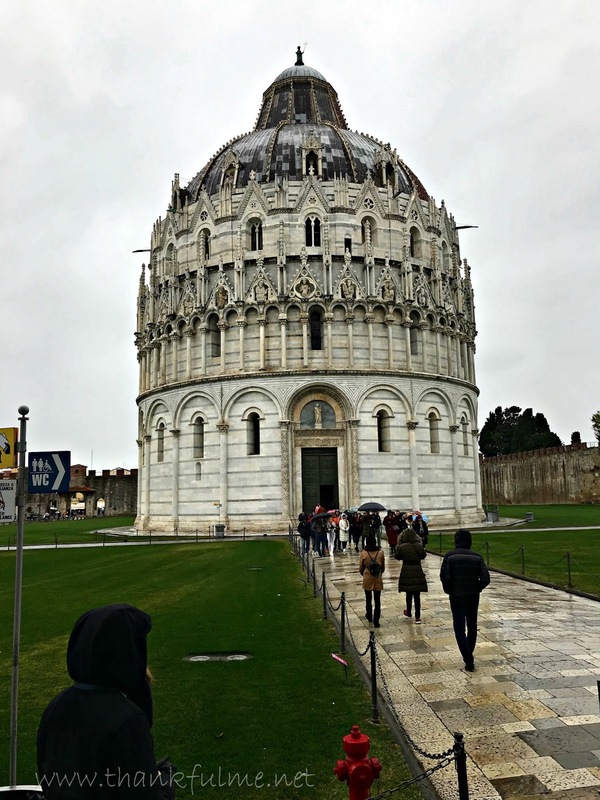 We climbed many different bell towers and duomos during our time in Italy, but the experience of climbing the Leaning Tower of Pisa was unique. About half of the time, the climb felt extraordinarily difficult, and the other half, it didn't even feel like an uphill climb. I found myself naturally wanting to walk toward the inside, or toward the outside, depending on which part of the lean I was on at the time. Once at the top, we arrived in time to hear the bells chime twelve. Rather, one bell did all the work, while the others stood silent. That surprised (and disappointed) me a little, but it was still interesting to hear. Though the tower, duomo, and baptistery rightly command attention, the entire square is surrounded by an interesting wall. Once we had climbed down the tower, we took some time to notice the wall and gates. 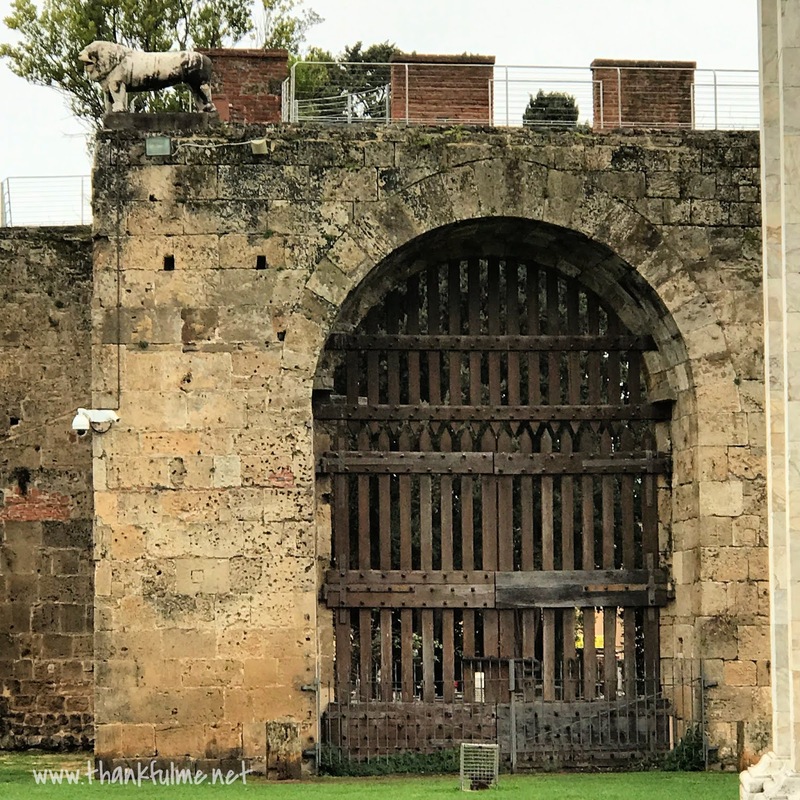 Photo: A high stone wall with an arched gate. A stone lion stands on top. Now, when I hear "Leaning Tower of Pisa," no longer will I imagine a tower just standing by itself. Nor will I only think of photos that show someone "holding" the tower, or "pushing" it up. I will remember it as part of a complex of buildings. My legs will remember the climb, and my ears will remember the reverberations of the chiming bell. What place have you visited that was much "more" in person? I'd love to hear about it! I didn't realize that, either, prior to my vacation. All of Italy is "much more," although i believe i enjoyed Florence the most.